Pogo has added new levels to Quinn’s Aquarium today. New levels unlock the second Tuesday of each month, so keep an eye out for the next set on December 11. This month’s release is Part 2 of the Mangrove Tank Exhibit. Note: you may not be able to see the new levels if you have not completed previous ones. 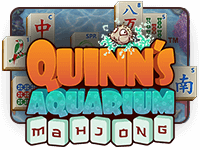 What do you think of new levels in Quinn’s Aquarium? What tile designs would you like to see? I hate Quinn’s Aquarium. It is impossible and no fun to play it. Level 21 is a hard one with very few moves before you get stuck. I checked the “game award” tab and there are no new badges – did POGO make some error ? All 30 were released with the new tank, 10 for each part. The best puzzle to do this on is a challenge round b/c you have 288 tiles to work with instead of 144. When you start the puzzle you get 1 pair of shells. Try to match them as soon as possible. Once you match them you will get another set of shells after you make 10 more matches. When you match the 2nd set you will get a 3rd set after you make 10 more matches. It continues like that until you match the 6th set. You will see the shells in the upper left hand corner. Do not use the undo button or you will not get any additional shells that game!! Be sure to do the random bonus challenges. Click “new game/quit” until you get a “challenge” puzzle. Work those challenge puzzles slowly and if you can’t get one just go to the upper right corner (gear) and click on “reset”. The puzzles become easier and easier with the “resetting”. A shuffle PU will help if you need “one more”. A shuffle ALWAYS brings an easy one to work. Good luck!